Serendipity Reviews: Exciting News About Amanda Stevens! Exciting News About Amanda Stevens! One of my favourite American authors is finally going to be published in the UK! 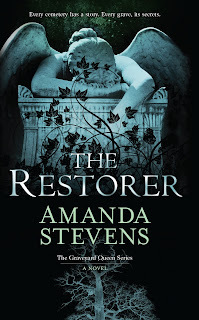 Last year I gobbled up The Abandoned and The Restorer (prequel and first book in The Graveyard Queen series) by Amanda Stevens. If you click on the titles you will see my gushing review. I was desperate for a publisher in the UK to pick up the series and finally they have! The Restorer will be released by MIRA on 7th September 2012 in the UK, with The Prophet due for release on 3rd March 2013. They are currently scheduled for both paperback and e-book release, although may become a digital exclusives. The digital only prequel The Abandoned will be released on 3rd August 2012 in the UK too. How exciting! Personally I can't wait to get my hands on The Prophet! Not sure what the covers will be yet so I can only show you the US ones. So glad to hear this! I spent forever last April going round Forbidden Planet and Waterstones asking about The Restorer and wondering why they didn't know anything about this book... I was quite new to blogging and didn't realise there wasn't a UK release planned. Yay for this! Fantastic :) happy reading. I do recognize those lovely covers. I really like this series so that is such good news!! I already own The Restorer but I'll definitely be getting the other 2.